(P1) In the ultimate act of lavish absurdity, Singapore restaurant Ce La Vi is partnering with Russian company World of Diamonds Group to offer what is being billed as the “most expensive dining experience in the world.” It’s one only two worthy diners will have the chance to experience at a date that Mashable reports, has yet to be specified, though the site references an August press conference that will ostensibly precede it. The companies will select the chosen duo, and what unfolds over the course of the eight-hour affair may actually make the $2 million price tag something of a bargain. A 45-minute helicopter ride over Singapore kicks things off, at which point the pair is escorted via a Rolls Royce to a private luxury cruise, reports Forbes. 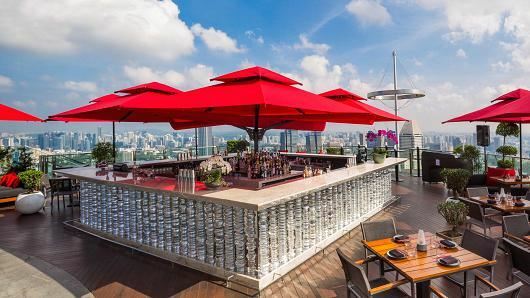 They are ultimately transported to Ce La Vi, which offers 360-degree views of the city from its perch atop the Marina Bay Sands Hotel. Why do you think the restaurants is doing this extravagant dinner for two? Would you like to partake in this dinner? Why or why not? Which part of the event do you like? Why? What is the partners’ statement for the event? Where is the caviar coming from? What is the estimated worth of the ring?